I have been busy writing on both my HubPages and Ezine Articles sites, about my hand-made wall hangings that I value so highly on my list of ‘favourite things’. Some years ago, I aspired to be a patchwork person…alas, I’m not…but a compromise was reached (in my mind). 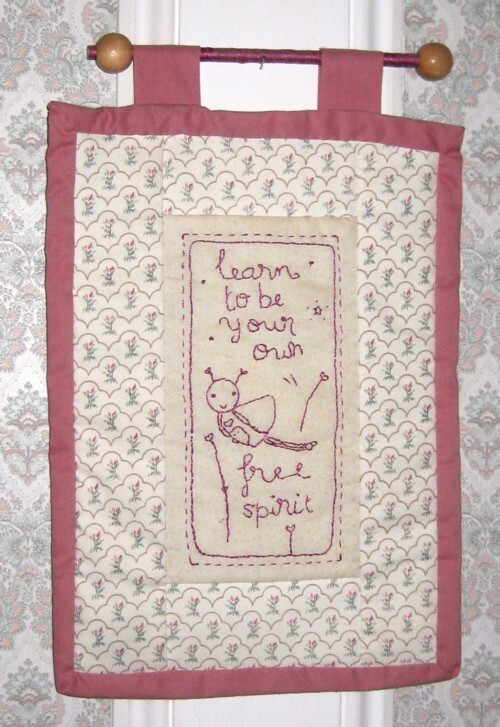 I would be a creator of hand-stitched wall hangings, complete with ‘meaningful messages’. This has much to do with how much I prefer the speed of a hand-held needle, as compared to its sewing-machine ‘sibling’…being basically built for comfort, rather than speed these days! I guess some people find them ‘corny’, and maybe don’t like them at all. To each his own! For others (like myself, with a heart made of marshmallow…or something similar) they are truly meaningful messages, even affirmations of Life and Love. If you are in the latter category, and want more detail of these and more examples of others, you may like to visit my Ezine articles that begin with – A Few of My Favourite Things (One about handcrafted wall hangings has been ‘published’, and another is waiting in the wings).